Rouge Tomate Chelsea | Bentel & Bentel Architects/Planners A.I.A. Rouge Tomate was relocated to a Landmark Carriage House in Chelsea, which was restored close to its 1864 original design. 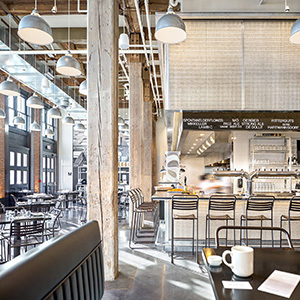 Rouge Tomate’s mission is to provide a dining experience that supports the total well-being of the individual and environment, so the selection of a building that needed extensive love and repair was a perfect match. The rare Carriage House was most recently a truck garage, but now restored with a change-of-use as wine bar and restaurant. The large openings, used for carriages, were filled with low-glare glass to maintain the appearance of large openings for carriages. The deteriorated doors were reused on the interior. New carriage doors were installed and details were rebuilt as per historic photos. The building consists of two long spaces with white-painted brick supporting walls. A new garden gate, granite paver walk, and greenery define the vestibule with a glass wall to the interior. The first space is the wine bar, with a bronze bar with custom-designed leather seats, leather-strapped lights and wine vault. Reclaimed wood was used for non-supporting walls. Slate floors and stone wine vessel emphasize the mineralogy of wine-making. End-grain block wood and live-edge wood tables bring warmth of materials close to the patron. The dining room occupies the second long space, with warm woods, an open kitchen and dining-bar. The highly sustainable oak floor reduces waste by retaining the natural curvature of the tree. The total square footage is 7,195 sq. ft. The dining room seats 75. There is a PDR on the second floor that seats 32, for which we installed a new elevator. No project brief is available for this project.